When I come upon an image that deserves A Closer Look, I am usually rewarded with a story that deserves telling as well. The giant whale on the beach of Ostende print led to a story of 18th century Europeans encountering strange and wonderful creatures. An 1895 photo of attendees at a rope pull led to a discussion of campus fashion. 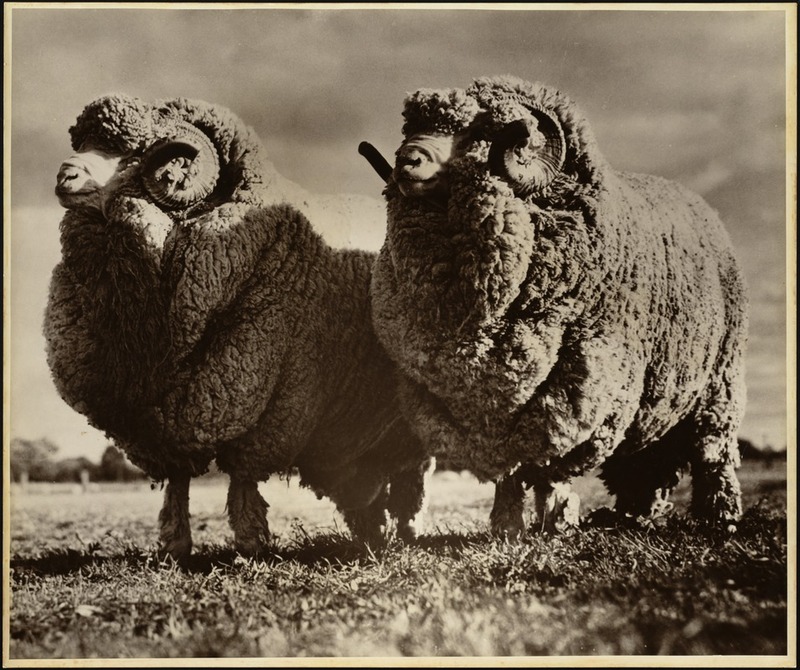 This photo from the Osborne Library of the American Textile Museum is just what it says it is: a frontal close-up view of two rams. The angle, looking up rather than down at the rams, adds stature to them. They almost seem to be standing at attention to review the herd. The backstory here is really just the caption on the back. The description on Digital Commonwealth ends, “Written on reverse: ‘His Majesty’ and friend.” Assuming we are meant to read the photo left to right, His Majesty is the first ram on the left. 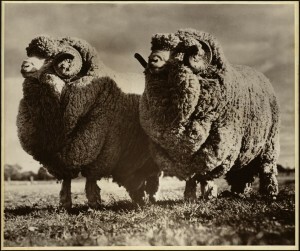 The ram on his right is his nameless friend. I can’t help but feel sorry for his friend. What makes one ram more nameable than another? The nameless friend seems as woolly to me. His horns turn out more than His Majesty’s. His snout seems a little shorter. I really don’t see much to choose between the two. It’s an eternal diss to what seems to me to be a perfectly worthy ram. I don’t know why the shepherd didn’t name the friend. Or why the photographer didn’t ask. I just know I am naming him “The Heir Apparent”. Posted in A Closer Look.Tagged American Textile Museum, Rams.